Manufacturing quality custom and standard decals, magnetics & static cling. Sun Art Decals Inc., was established in 1975 with the primary purpose of designing and manufacturing decal markings for commercial vehicles. Over the years, we have produced decals for buses, trucks, trains, boats, cars, aircraft, parking decals, organization decals, decals used as architectural markings, etc. We have doubled our physical plant size and grown to the point that we now distribute decals in all fifty states, Puerto Rico and Canada. We attribute this growth to our ability to accommodate the requirements of large and small operations. 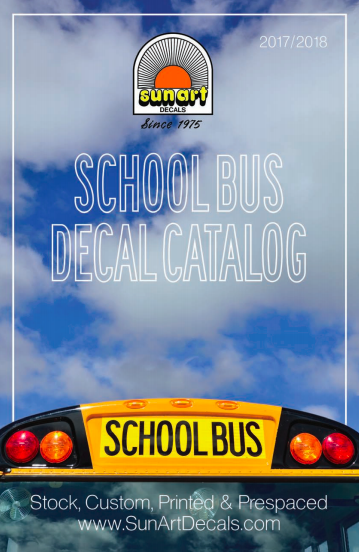 Serving The School Bus Industry With The Most Comprehensive Decal Buying Guide Our 20 page SCHOOL BUS DECAL BUYING GUIDE contains over 350 illustrated SCHOOL BUS decals. All Alphabetically Listed, Numbered, and Described in Detail. To download a PDF of our catalog, click on the cover above.